The new I. Miller Building and Shop, at Fifth Avenue and 46th St., New York were opened with an informal reception and dance on Monday evening, February 14. 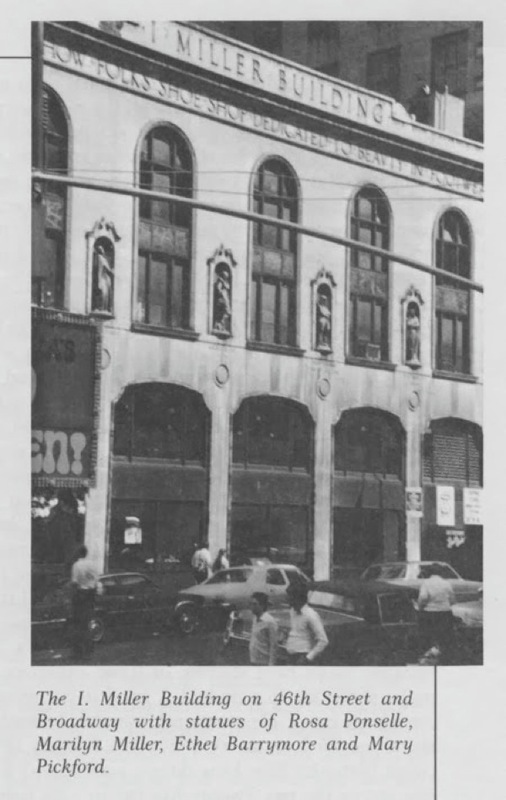 It is an eleven-story structure, and I. Miller & Sons, Inc., will use the main and mezzanine floors as salesrooms. These are elaborately furnished with comfortable settees, are handsomely decorated and show novelty in style of display. The children's shoe department is located in the basement and is finished in white enamel, with an ingenious arrangement of swings and chairs, and a display of baby shoes surrounded by all kinds of toys in show cases. The Millerkin sales girls and nurses will look after the juvenile customers. The third floor will be used by the private and general offices for the firm. 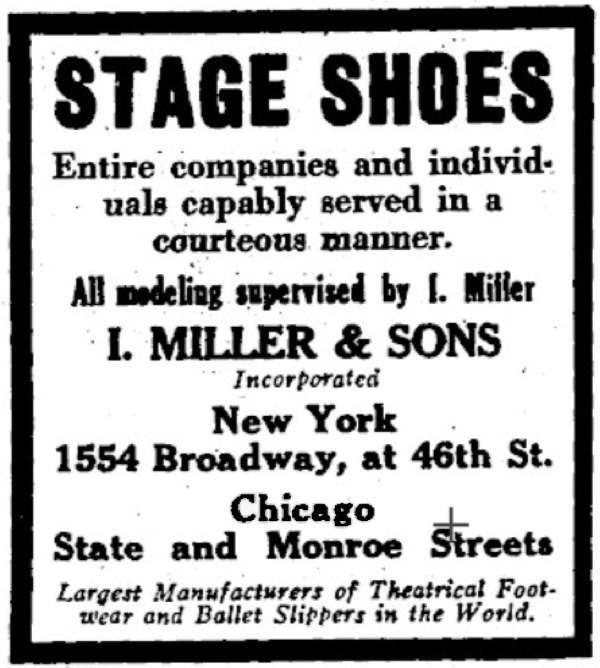 A large crowd was entertained by I. Miller, his family and attaches, at the opening, and congratulations on the splendid establishment were showered upon the enterprising firm. A fine orchestra furnished the promenade and dance music, and refreshments were served in profusion. WHO ARE THESE FOUR LEADING ACTRESSES? Who are the best loved actresses in the drama, comedy, opera and film divisions of American stage entertainment ? Their names are being sought by I. Miller who has just completed an imposing structure at 46 St. and Broadway, with the end in view of honoring them and their professions by placing their statues in four golden niches on the exterior of the structure, where Broadways throngs, may view them in passing. 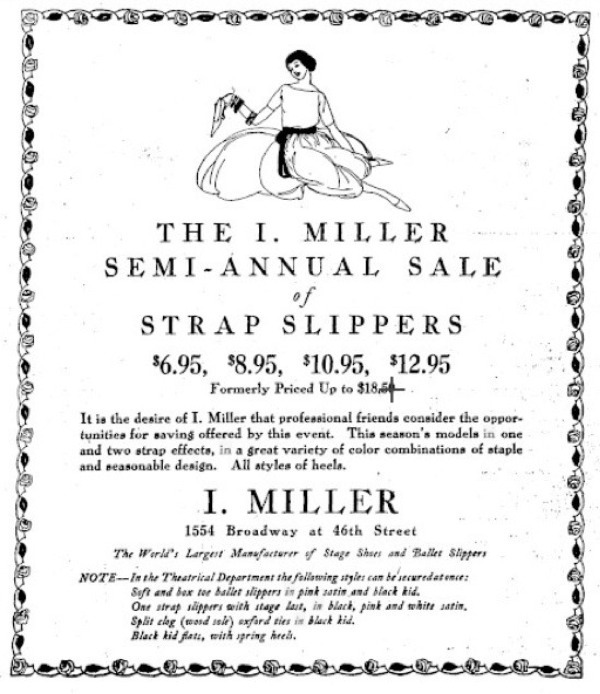 Thirty-five years ago Mr. Miller came to America from Europe, a poor young man whose trade was that of designing shoes. In appreciation of the patronage of theatrical people, which was the foundation of his success, he desires to make the building a testimonial to their friendship. When the niches were included in the structure's scheme of exterior decoration, the idea came to Mr. Miller to use them in honoring the four departments of entertainment mentioned, through the use of the statues. He was at a loss, however, to know just how to go about the task of making selections. Friends in the amusement business suggested he permit the amusement-loving public to decide. The plan pleased him and was adopted. In the near future an inquiry will be launched through a novel plan B which, it is hoped, the identities of the four best-loved actresses in the four lines will be learned. A competent sculptor then will be commissioned to make the statues and these will be placed in the niches with appropriate ceremonies.